See for yourself with a free trial! In part because of their success with LANGUAGE! Live, Knox County is the first large, metropolitan district in Tennessee to be recognized as an “exemplary” district. Many of the district’s struggling adolescent readers believed that they would never be able to learn how to read—that they were “too dumb” to learn as they had repeatedly failed. After the district implemented LANGUAGE! Live for middle- and high-school readers who were struggling, teachers reported that it was tremendous to see students realize that they are smart and can learn to read successfully. Teachers say that LANGUAGE! Live bridges the gap between where students actually are and where they need to be. While all teachers successfully implemented LANGUAGE! Live, the teachers who were the most successful were those who participated in the Year Long Reading Course based on the LETRS program—both programs by Voyager Sopris Learning. One program director describes it as a master’s level course in teaching students how to read. All struggling readers experienced Lexile growth, but students of the teachers who participated in the professional development program experienced the greatest growth. Teacher Antavia Hamilton-Ochs at Bartlett High School in Anchorage, Alaska, says that students with reading deficiencies are constantly reminded in every class and subject that they have low reading skills. Adolescents who haven’t experienced academic achievement can be very dispirited. After implementing LANGUAGE! Live with her students, Hamilton-Ochs was surprised to see how much of a difference the blended solution made for them. She has a mixed class in both Level 1 and Level 2, so she rotates the students between teacher-led instruction and the online component. 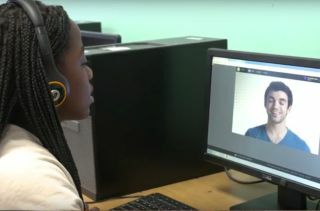 She says the students were immediately engaged because of the avatars, peer videos, and the fact that the program was designed specifically for secondary students. LANGUAGE! Live supports both teachers and students with instructional and learning strategies. For example, Hamilton-Ochs provides students with immediate feedback after listening to their voice recordings. These recordings allow her to see who needs additional help and who is doing well enough to move to the next level. Some Bartlett students have shown significant growth of up to two to three years of progress in one school year—up to 300 Lexile points of growth. Charleston County (SC) Schools was looking for a program for struggling adolescent readers to fill in the gaps of the reading instruction they missed in elementary school. The district chose LANGUAGE! Live to use with 812 students in 23 schools. School leaders wanted an age-appropriate reading program with multiple components that would engage their struggling readers. With LANGUAGE! Live, they found a comprehensive, blended reading solution that focuses on both foundational and advanced literacy skills. Teachers report that students are able to work at their own pace, and on different levels than what their peers are on. LANGUAGE! Live’s avatars and peer videos resulted in high levels of student engagement and buy-in. The blended learning format allows for both online and teacher-led instruction. Writing skill development is also integrated in LANGUAGE! Live, providing teachers and students with a comprehensive ELA program. Repeating the reading strategies over and over has resulted not only in reading success, but students are also taking those learning strategies into their other classes, so their success is extending to other parts of the curriculum as well. Burke Middle School executive principal Maurice D. Cannon, Sr. says, “One hundred percent of students participating in LANGUAGE! Live have seen significant growth.” In many cases, the growth has been between 200 and 500 Lexile points in one year. Using LANGUAGE! Live has been a life-changing experience for Hernandez students who have struggled to meet grade-level benchmarks in reading. The program individualizes instruction for every student. Not only are students achieving proficiency in reading, but they’re also gaining confidence so their success spreads to other subjects. In addition, teachers have seen a correlated increase in STAR achievement test scores. LANGUAGE! Live redefines literacy intervention. Struggling readers in grades 5–12 excel with two times the literacy gains to close gaps faster than they can with any other literacy product. LANGUAGE! Live is a comprehensive literacy solution that focuses on foundational and advanced learning skills with digital and teacher-led intervention to significantly improve reading and writing skills. It meets students where they are and gets them where they need to be. LANGUAGE! Live inspires new levels of confidence and drive in students at all levels who are struggling to become successful readers. This award-winning, blended literacy program accelerates literacy growth so students can meet grade-level expectations and participate in core instruction. With LANGUAGE! Live, students discover the impossible is possible. LANGUAGE! Live is a blended model that combines the power of teacher instruction with online practice and instruction. Teacher-led Text Training helps students advance in their knowledge and understanding of vocabulary, grammar, and comprehension, and—unlike other programs—LANGUAGE! Live also provides extensive writing practice. Online Word Training addresses foundational skills including phonics, spelling, sentence structure, and fluency. Students love the avatars, peer videos, and relevant content. As students progress in reading increasingly difficult texts, their vocabulary grows and they learn grammar and syntax in context so that their comprehension and writing improve as well. All students are successful because LANGUAGE! Live was designed specifically for them. In a blended classroom with students at different levels, a solution that’s easy to learn and implement is needed. LANGUAGE! Live simplifies it all with expert support, comprehensive teacher training, and on-demand coaching to successfully prepare teachers. • Flexible—able to be implemented in any classroom. Find out more about how LANGUAGE! Live closes gaps in students reading skills faster than any other literacy program. See for yourself with a free trial!